We started our Story of the World journey off with a review of the fall of Rome, then quickly moved on to Celtic monks. Medieval style. We made double-edged axes out of recycled cardboard boxes and tubes. The girls painted them gold and brown, and wrapped them in twine to look authentic? realistic? (conceivable?). The brooch was colored and glued onto leftover cardstock and we added a pin to the back. It's funny because the 10yo started coloring it before I could give her directions (these projects are both from The Story of the World Vol II Activity Guide). She finished just as I started reading: Color the brooch green, red, yellow and blue. Little turkey had randomly picked all the right colors. Lucky. We also carved monk-ish cross necklaces out of air-drying clay. That my little monks actually ate (and without holding their nose!) Yay, monks! Oh, I'm so far behind! I will catch up. I will catch up. Ugh. OK, well, here we go. So, for science this year we are doing a year of Biology, starting with Human Anatomy. Which means we'll be spending the next 10 weeks or so studying body systems (4th grade and 2nd grade). I decided to start with the Integumentary System first (AKA Skin), and after downloading several coloring and labeling sheets online, I also picked up a stack of books from the library, one of which was our favorite science/craft books, Arty Facts. Now, if you've been following our homeschool adventures then I'm sure you've already heard me go on and on about this book series. We used several last year for Planet Earth, Space, and Ocean studies and well, needless to say we love these books. So naturally for our semester on the human body we had to pick up the Arty Facts: Our Bodies book and work through a few of the projects. We made multi-cultural collages to go along with our discussions about melanin and different skin pigments and colorings. And when we made our way to the Muscular System we made these cool jointy acrobat dudes as examples of how our joints work. Because somehow our discussions about skin and pigments and melanin led to a discussion about fingerprints. Which led to a discussion about Forensic Science. Which somehow led to blood splatter. Now, this may or may not have something to do with my current obsession with Dexter and my watching all 5 seasons back to back over the summer. Or it could just be that blood splatter seems like a really cool thing to discuss the first week of homeschooling in the 4th grade. In my defense, there is a blood splatter discussion/art page in the Arty Facts: Bodies & Art book so I like to think we were just following along. Now, determining how blood looks as it splatters down from various heights...well, let's just say that's all part of the (ahem) curriculum we're following. Well, we lost one of our pet ducks recently. 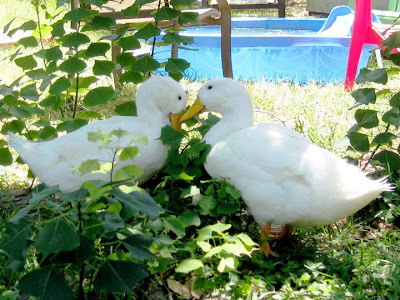 We originally called him Caesar, but sometime after his mate, Cleopatra, started laying eggs we began referring to them both as Mama and Papa duck. He was naughty and pesky, but great fun and he took good care of his lady. In fact, I'm certain that's how he died - defending and protecting her. Papa duck was killed in a late nite fox attack. The fox must have been small as he wasn't able to haul his prey over the fence afterward, as he had apparently planned, but he was able to slip under the pen gate in a space less than 2 inches high (after a bit of digging) in order to attack the ducks. I'm guessing he attacked Mama duck first, and in an attempt to protect her, Papa duck managed to get her free (by ramming into the pen gate and knocking it down) and allowed the fox to turn on him instead. We found her the next morning wandering aimlessly in the yard in a state of shock, and badly wounded. After investigating the crime scene (Lord help me I've been watching way too much Dexter), the girls and I scooped Mama duck up and brought her inside to keep her safe. We put her in the bathtub with some food and water and left her alone for a few hours so she could calm down. We then went out and buried Papa duck, next to the bunny we lost earlier this year. I gave Mama duck a bath and put medicine on all her wounds. She had an eye that was foaming over and appeared to have been punctured so I washed it and put medicine on it as well. I really didn't expect her to be alive the next morning when I went in to check on her. But, amazingly, she was alive...and hungry. And looked greatly improved. I filled the tub and let her take a bath which seemed to lift her spirits. She then ate really good and spent the rest of the day quietly recovering. After 4 days of recovering in the bathtub (some days eating, some not) she started quacking more and seemed to want out. Her wounds were healing, her eye was looking better and she clearly was no longer appreciating the isolation, so we let her go outside for a few hours. She immediately started cleaning herself, and would eat as long as I held the bowl near her head (I'm fairly convinced she has internal neck injuries), but despite being clearly lost and depressed, she started wondering the yard in search of the chickens. She was raised with 4 of the chickens (they were all one week old when we got them) so thankfully she still has something of a flock to be with. Ducks don't do well singularly and often become depressed after losing a mate, particularly. They, like chickens, are social animals and do best when there's at least one other of their kind around. We let her stay out all day and she did fine. She walks with a bit of a limp and shows no interest in swimming yet (not sure she's still waterproof). She clearly can't see well (if at all) out of that one eye, but she seems to be managing as best she can. 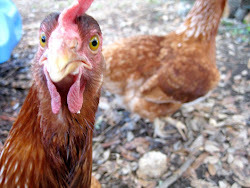 She stays with the chickens and quacks when we talk to her. I think these are good signs. She hasn't laid an egg in 3 days but I don't feel any stuck inside her so I think it's mostly just because of the shock and trauma. We're keeping her in a dog kennel at night now, close to the house, but plan to create a more secure pen for her in the next few weeks. My greatest concern is her depression (Papa duck was good at telling her where to go and what to do), but hopefully she'll learn a new way of existing with the chickens and in a few months, after we move, again (big sigh), we can think about getting her another duck friend. She clearly has a strong will to live, and while we share in her sorrow over losing Papa, we are very grateful we got a chance to be a part of his life, and very thankful we still have our Mama duck. Well, it seems we've officially started up our second year of homeschooling. 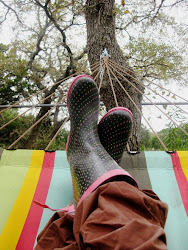 We spent a fun summer swimming just about every day at the lake and ﻿now, waterlogged, we're ready to get back to learnin'. Well, at least I am. I gave the girls an opportunity to go back to public school this year if they wanted (I'm all about options), but they said, "No no no! we're good here" (and said it while still in their pj's at lunchtime I might add). So, onward we go...to 5th grade and 2nd grade. Well, technically 4th grade I suppose. I've come to the conclusion I should have held my oldest back for another year before letting her start kinder. Her birthday was only two weeks past the qualifying age so she's always been the youngest in her class. After watching her struggle in public school the past few years, and seeing where she's at now, academically, I really think she's at more of a 4th grade level than 5th. Which is absolutely fine! We're in no hurry and I have no interest in keeping up with academic dogma. As long as she's challenged, but not frustrated. As long as we're within range, I know she'll not only catch up, but will pass on ahead when she's ready. So, back to school for us means back to the library! We have a wonderful local library, but we also take trips to town when we can't find the books we want locally. The stacks pile up each week. My job is to make sure the correct book gets returned to the correct library. With six library cards and two libraries, this is something I average about a B+ with. Hoping to improve to an A this year. Fingers crossed. So, we're about a month into our semester and so far these are some of the stacks we've been working through. Including videos and books on CD. I added art history, music appreciation, and geography to our curriculum this year. Along with art and piano lessons (I'm determined to prove the piano we've been moving from house to house the past few years is more than just a guilt-inducing love-hate catchall piece of furniture), which has fattened up our library stack somewhat. But I've come across some wonderful art books; some I ended up buying I liked them so much. If you're teaching art to young kids be sure and check out the Usborne (I'm slowly learning to not just like, but love, the Usborne books, like in a wicked want to make out with them kind of way) Complete Book of Art Ideas. The Children's Book of Art is also wonderful, as is the Usborne Art Treasury and the Usborne Big Book of Things to Draw, oh, and Usborne's Drawing Faces. Gah! I need an intervention. Some of you have asked what curriculum, or style of teaching, we're doing. We're following (loosely?) the curriculum suggested in The Well-Trained Mind, which is a guide to classical education.﻿ This is our second year with this method and so far we love it. I've made a few modifications to suit our personal needs, but overall I think it's a great outline to plug into, especially for those new to the world of homeschooling. Specifically, we're on Volume Two of the Story of the World, which is a history activity/chapter book put together by Jesse and Susan Wise (the mother-daughter team behind The Well-Trained Mind). I couldn't love these books more. Granted, I love history so I may be biased just a bit, but these study guides, combining literature and history, and teaching history chronologically, are simply brilliant. In Volume Two we pick up with the fall of Rome and go thru early Renaissance (Middle Ages). So, some of the books you see in our library stacks reflect the religion, literature, and history going on around 500-600 AD. Both girls are being taught the same history together, but the 4th/5th grader has to take more notes and read/summarize harder books/texts. This makes life so much easier. The same goes for our science. Both girls are studying the human body this semester (for 10wks), so I'm only having to teach one lesson to both kids, but the older one has to do more outside reading and take more notes/quizzes, etc. than the younger. I'm not willing organized enough to homeschool different lessons to different kids. I imagine next year I'll have to re-evaluate things, but for now this works for us. (All of this is explained in depth in The Well Trained Mind). Speaking of Bill Nye. Do you ever get his intro song stuck in your head? Bill Bill Bill, Bill Nye the Science Guy. Bill Bill Bill. My kids are currently on a Bill Nye roll. Can't. Get. Enough. Bill. Bill. Bill. Sometime during the first week back to school I made these chair slings, pockets, junk holders for the back of each kiddo's seat at the table. I had some scrap fabric and ribbons and thought, hey, why not. These little pockets are proof that when things are out of sight, they are out of mind. But hey, at least the Chinese erasers and cursive handwriting books have someplace to hide. So, a lot of our literature each semester ties in with our history. So this year we'll be reading classics like an abridged Canterbury Tales, Beowulf, Song of Roland, ﻿Arabian Nights, King Arthur, Robin Hood, Shakespeare, etc. But we're also reading books together, and I'm assigning independent reading as well. So just for fun, and to limit mental breakdowns every week when we make our library runs, here's a reading list I've put together for this year (for both 4th and 2nd grade): Nancy Drew, Harry Potter, Shiloh, Winnie the Pooh, Because of Winn-Dixie, James and the Giant Peach, Love That Dog, The Little White Horse, The Trouble With Wishes, Sideways Stories, Tom Sawyer, The Puppy Sister, My Father's Dragon, The Water Horse, Blubber, The Talented Clementine, The Reluctant Dragon, Gooney Bird Greene, The Cricket in Times Square, The Black Stallion, Walter: The Story of a Rat, and whatever else comes up over the next few months. If you have any other book suggestions would love to hear them! Math - both girls are doing the DK Math Made Easy workbooks for their respective grades. Science - we're currently studying the human body (10wks), then animals (20wks), then plants (8wks). 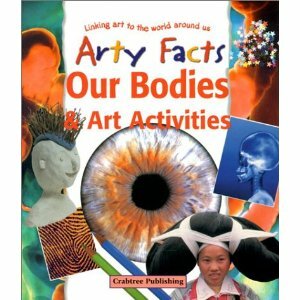 My favorite science/craft books are the Arty Facts. Great way to combine science with art. Language - we're working thru a Spanish workbook together, and I just ordered a Latin book called Minimus Pupils. I'll let you know how it is. My 8yo wants to learn French - ha! working on that! Art History - we're picking one artist a week and using library books and videos to study from. We're also using the Usborne Art Treasury to practice some of the art skills. Getting to Know the World's Greatest Artists is a helpful series as well. Music Appreciation and Piano Lessons - for this we're just using online materials as well as books, CD's, and movies to study the different classical composers (one each week). I have a few simple piano books that I'm teaching the girls to read music from but still shopping around for one worth buying. If you have any suggestions I've love to hear them! And this one has wonderful lapbooks! We're currently working on a Medieval Times lapbook, including lots of information on Vikings, but plan to do their Renaissance, Glass Blowing, and Fall lapbooks as well. Great stuff here! ﻿We celebrated a birthday recently. My oldest gypsy gal hit double digits. The big 10. She told me the other day it seemed like she was 9 for a really long time. I have to admit, it kinda did. She's thrilled to finally finally be 10. And so am I. So far it seems like a super groovy age to be. And she's a super groovy kid. 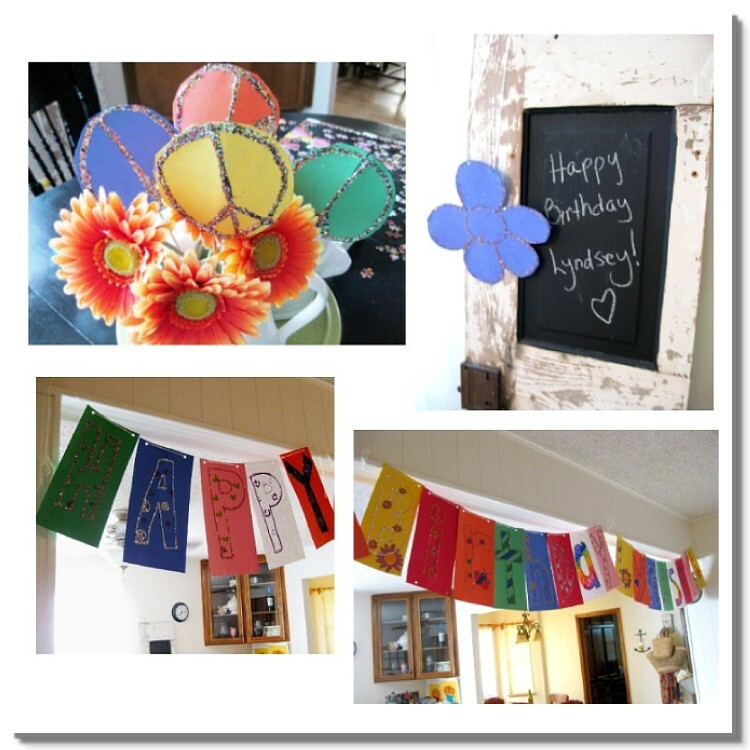 So we gave her a super groovy (yet very simple) homemade party - filled with lots of colorful homemade decorations and treats. And a few sweet friends to swim and slumber with. Simple. Homemade. Those really are wonderful words. Latch hook! Oh boy does this take me back. 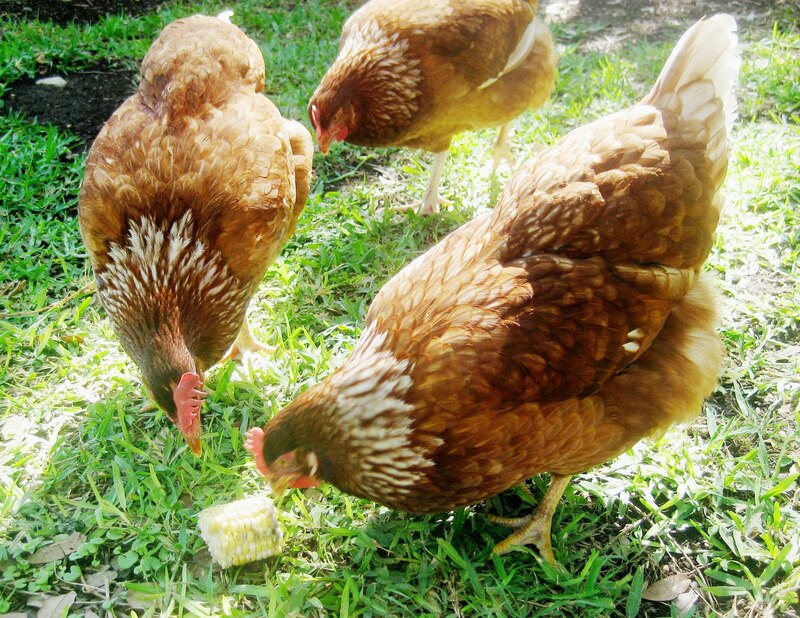 I wasn't sure how the girls would take to it; and in fact, at first they just sorta stared at me like I was crazy. Especially after they saw the tool. Which does look sorta medieval I suppose. But once they got the hang of it, well, they did just fine on their own. Even the little one. But after she dried her tears, she walked right back in, sat down, tried it one more time, and immediately picked it up. Go figure. (Apparently we all struggle to remember she's only seven). Older girl got it right away. And her latch hook project was bigger...and didn't have the picture painted on the canvas backing which meant she had to work with grids (ya know, just a few minor major differences she made sure we all understood). Once all the latch-hooking was complete, it was time to sew. I ran it under the sewing machine completely unconvinced it would actually hold together (it's at times like this I find keeping expectations low seems to work well). However, I did not attempt to sew right sides together. Because of it's odd shape I just sewed it as it was, folding the seems in and sewing very close to the yarn. The kids then stuffed the pillows and sewed the remaining stitches by hand. And viola! Instant pillow to throw on the bed and collect dust mites. But hey, at least it's cute. And older gal is very proud of herself for making it. The littler one I sewed right sides together on the machine. It was straight lines so much easier to maneuver. And little girl sewed her last few stitches by hand, after it was stuffed. And the little girls who make them! And since the project was a success...guess who picked out two more latch hook kits?! Certainly not me...though I will admit, it's hard to look at them and not be tempted to do just a few rows.